The tunnel diode is one of the most significant solid state devices which have made their appearance in the last decade. Tunnel diode was invented in the year of 1958 by Leo Esaki. The germanium material is basically used to male tunnel diode. They can also be made from materials as gallium arsenide and silicon materials. The tunnel diode exhibits are also negative resistance in their operating range. therefore it can be used as an amplifier, oscillator and in any switching circuits. The tunnel diode is heavily doped, highly conductive PN junction diode in which the electric current decreases as the voltage increases. It works on the principle of the method called a tunneling effect. The tunnel diode is used as a very fast switching device in the computer. The tunneling is the phenomenon of conduction in the semiconductor material in which the charge carrier punches the barrier instead of climbing through it. The tunnel diode is a two terminal device with n-type semiconductor called as a cathode and p-type semiconductor called an anode. It is also used in high-frequency oscillators and amplifier. The symbol of the tunnel diode is shown in the figure given below. It is a two terminal device with p-type semiconductor acting as anode and n-type semiconductor act as a cathode. The n-type semiconductor material emits the electron so it named as the cathode while in p-type material attracts the electrons hence it named as the anode. Under the forward bias condition, the immediate conduction occurs in the diode because of heavily doped conduction happen in the diode. The current in the diode reached the maximum current that diode reached a maximum value of Ip and when the voltage applied is Vp across it. The current value is decreased when more amount of voltage is applied. And it current keep decreasing unit it reaches a minimum value. 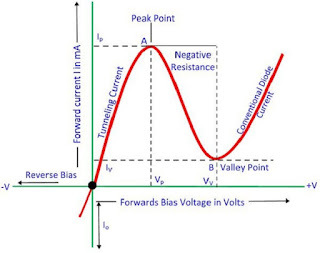 This minimum value of current is called the method valley current Iv. The tunnel diode and normal PN junction diode characteristics are different from each other. 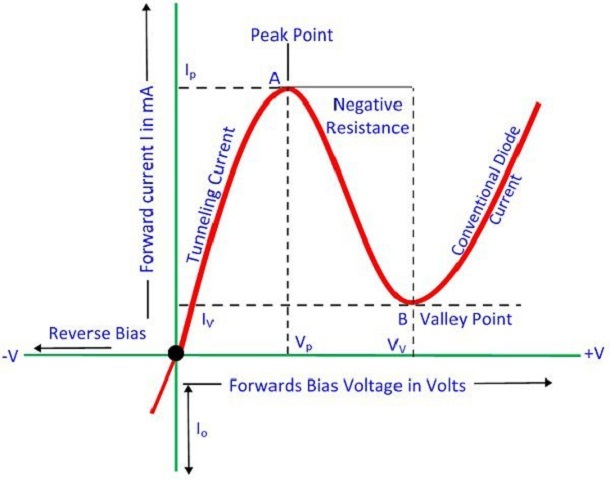 Under the reverse bias condition, the tunnel diode act as a back diode or backward diode. In reverse bias condition, the empty state on the n side aligned with the filled state on the p side. The electron will tunnel through a potential barrier. Because of its high doping concentration tunnel diode acts as an excellent conductor. The graph above shows that A to point of B the value of current decreases with the increases in voltage. So from figure A to B, the graph shows the negative resistance region of the tunnel diode, This region shows the most important property of the diode. Here in this region, the tunnel diode produces the power instead of absorbing it.